For more information about templating and how to modify the default templates of the controls from the UI for WPF suite read the Editing Control Templates topic on this matter. [Grid] - is of type Grid and hosts the RadDateTimePicker's template. BackgroundVisual - represents the Border around the RadDateTimePicker's input box. MouseOverVisual - represents the Border used to highlight the control's input box in the mouse over visual state. FocusVisual - is of type Border and represents the control's outer border when it is focused. [Border] - is of type Border and represents the control's inner border when it is focused. PART_DropDownButton - represents the RadDropDownButton which shows the RadDateTimePicker's content. [Grid] - is of type Grid and hosts the RadDateTimePicker's content (the calendar and the clock views). DropDownIcon - represents the content inside the DropDownButton and is of type ContentControl. ValidationTooltip - represents the RadDateTimePicker's validation tooltip visible when the control is in invalid and focused visual state. The ValidationTooltip is of type Telerik.Windows.Controls.Chromes. 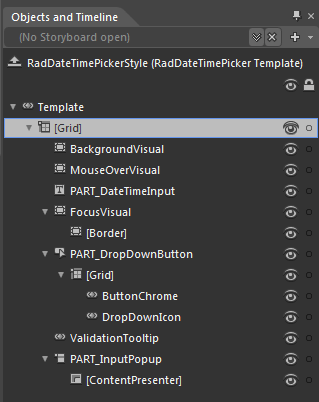 PART_InputPopup - represents the control showing the RadDateTimePicker's Preview tooltip and is of type Popup. [ContentPresenter] - represents the hosting control for the RadDateTimePicker's Preview tooltip and is of type ContentPresenter. 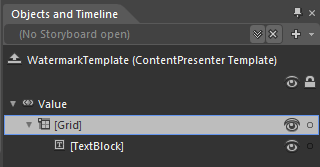 You can also modify the default template applied to the RadDateTimePicker's Preview tooltip visual element. [Border] - is of type Border and represents the preview tooltip's outer border. 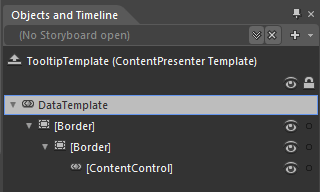 Border - is of type Border and represents the preview tooltip's inner border. ContentControl - is of type ContentControl and hosts the RadDateTimePicker's preview tooltip content. The RadDateTimePicker's default template also gives you a simple WatermarkTemplate which you can further customize in order to meet your requirements. [Grid] - hosts the RadDateTimePicker's user input box content and is of type Grid. [TextBlock] - represents the RadDateTimePicker's watermark content.